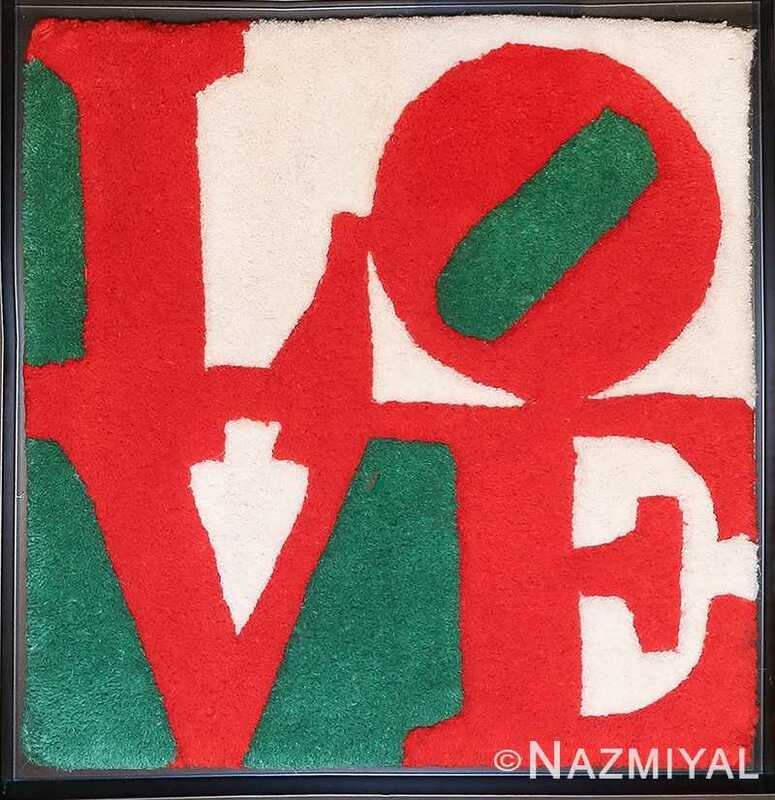 Beautiful Modern Small Size Pop Art Love Rug by Robert Indiana, Country of Origin / Rug Type: India Rug, Circa Date: 2007 – Love is the answer to many of the world’s problems. 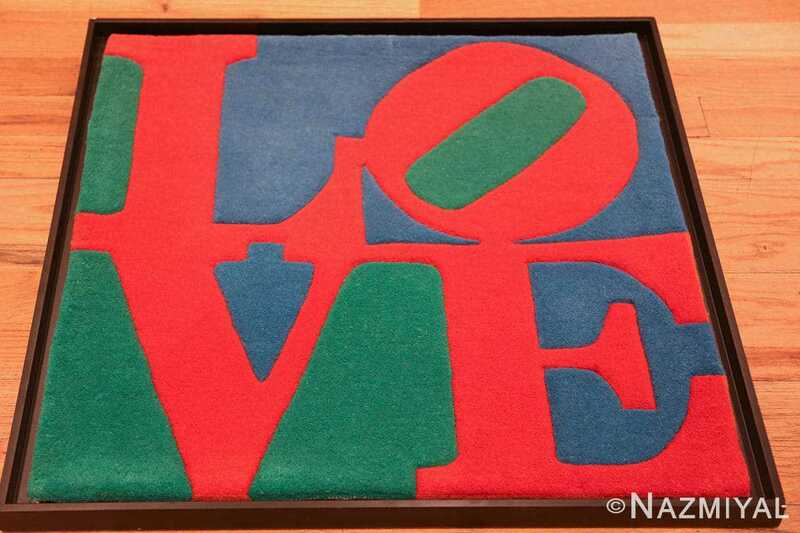 This vibrant Love rug by Robert Indiana can transform any space into a cheerful and happy one. 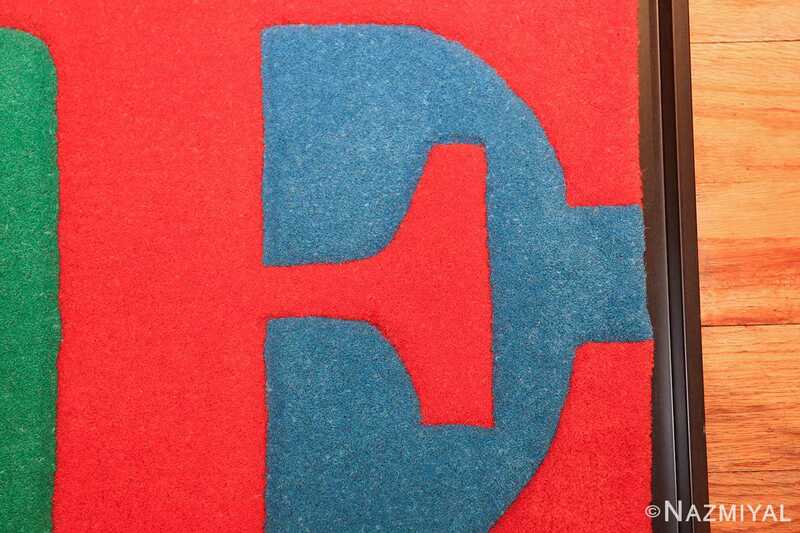 This vintage rug by Robert Indiana features graphic design elements based on iconic American pop art imagery. This vintage rug is small, which makes it the perfect size to frame and hang on a wall as a tapestry rug, or to use as a small scatter size area rug. 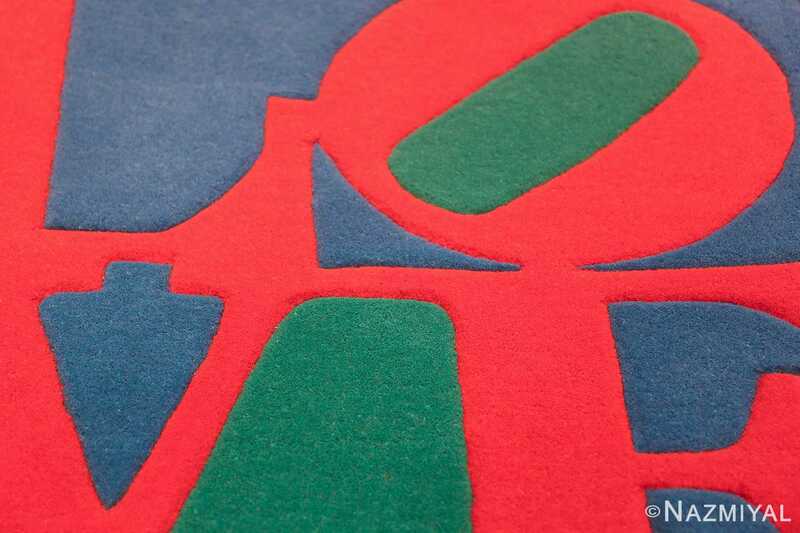 The simple design of the art rug presents the clear message that it wishes to convey. It uses only three solid colors that are uniform in tone. 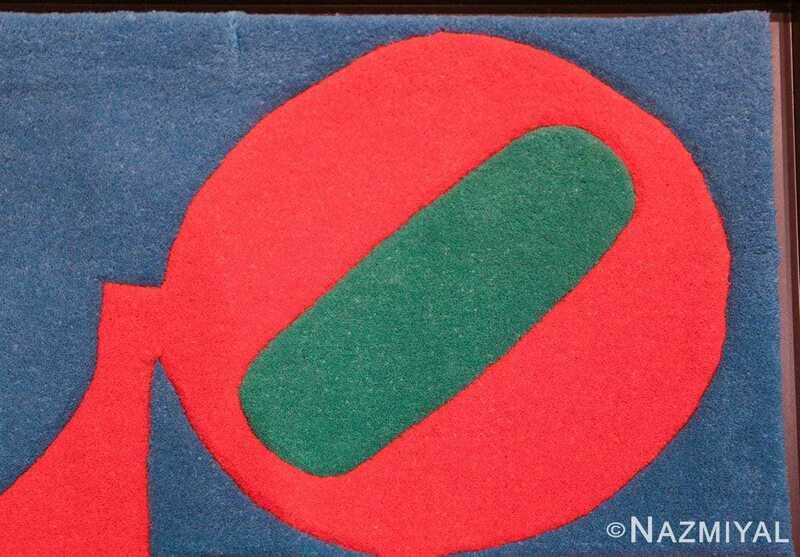 The bright red letters stand out boldly against the blue and green background. 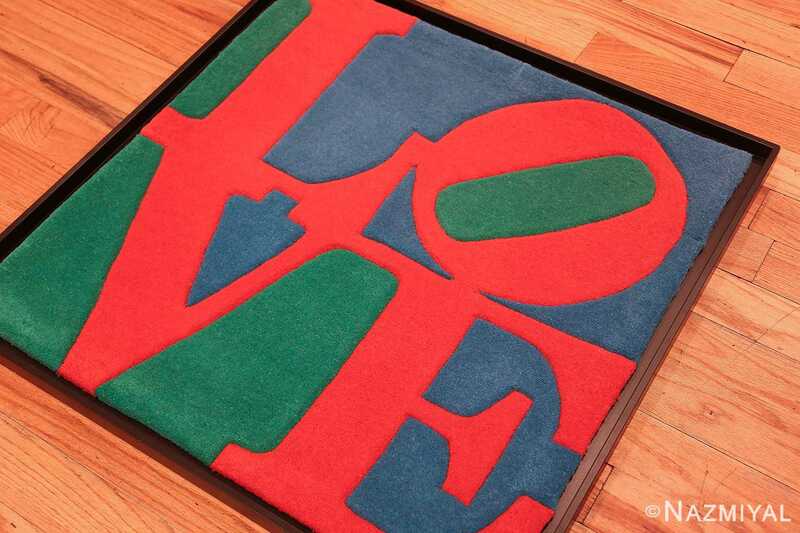 This juxtaposition gives this Pop Art Love rug by Robert Indiana an almost three dimension feel. 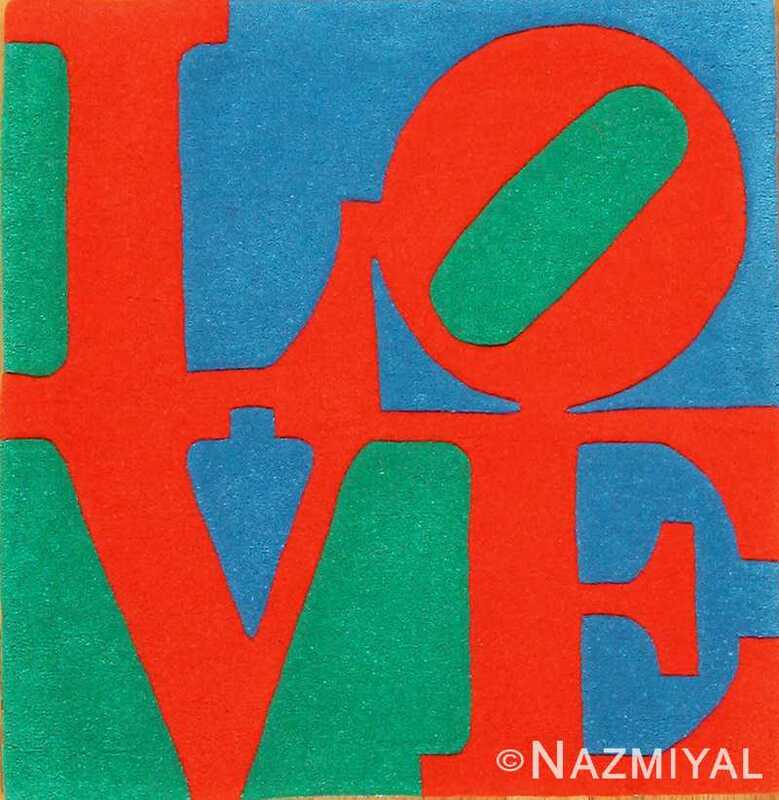 Robert Indiana used a classic font typography and a layout that gives each of the letters equal space. The slightly tilted O adds interest, as does the iconic font itself. This gives the Indian rug a balanced feel, as does his use of a divided background that is split between blue and green. The bluish tone of the green blends with the blue to create a cool background that contrasts with the fiery, warm red of the letters. 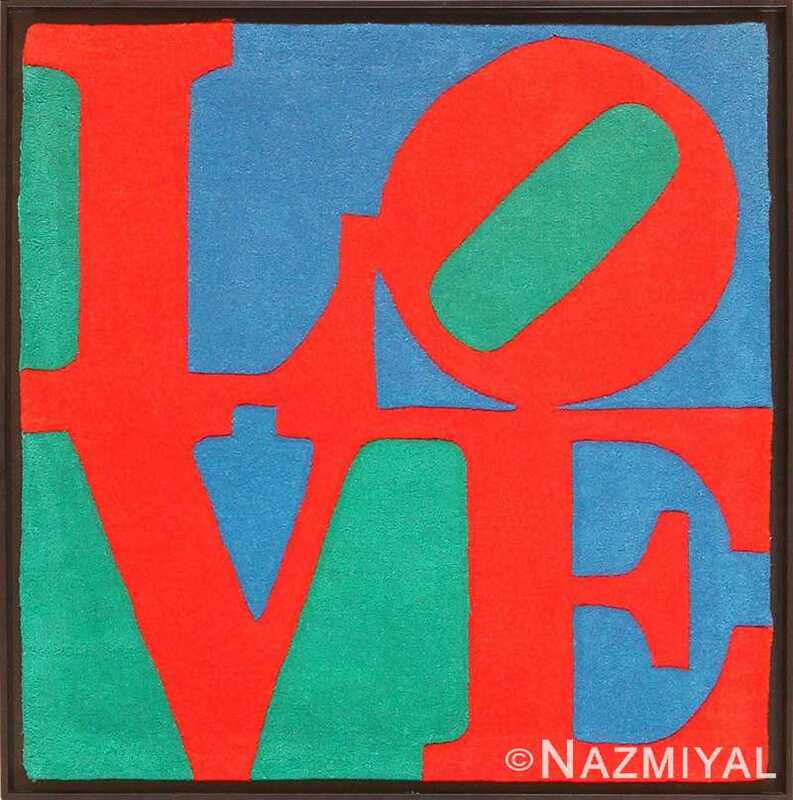 This classic “Love” design was first seen in a painting at the Museum of Modern Art during the pop art movement of the 1970’s. 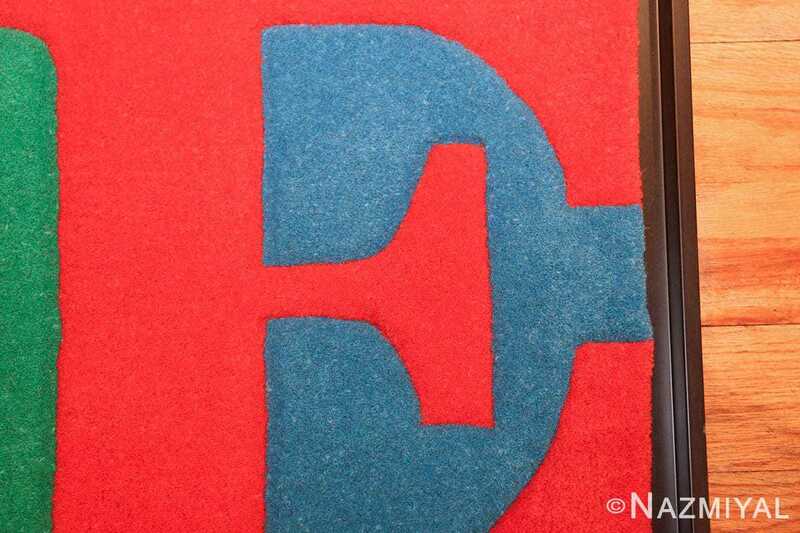 Indiana kept the vibe and style of the original design, only changing the colors. 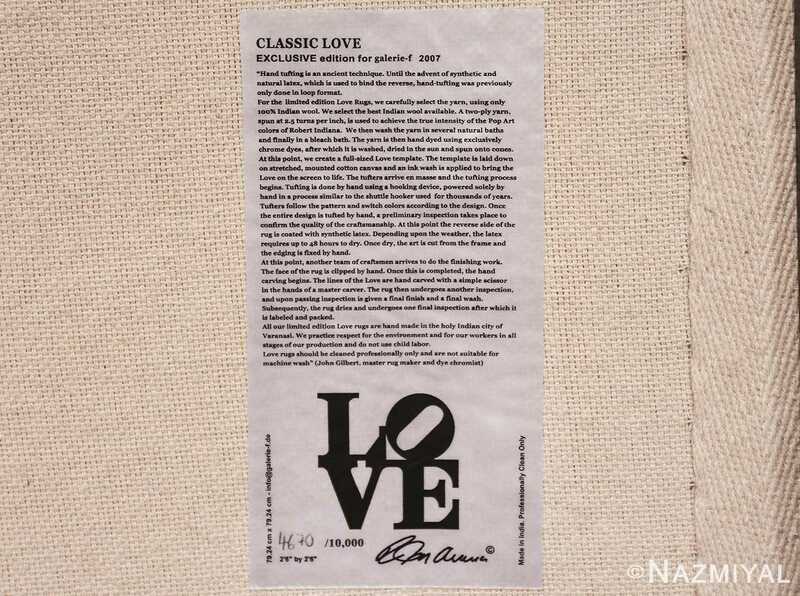 This design is one of the most recognizable pieces of modern pop art, and Indiana features it in a series of Love rugs that are fun and that reflect the ideology of the time that they represent. 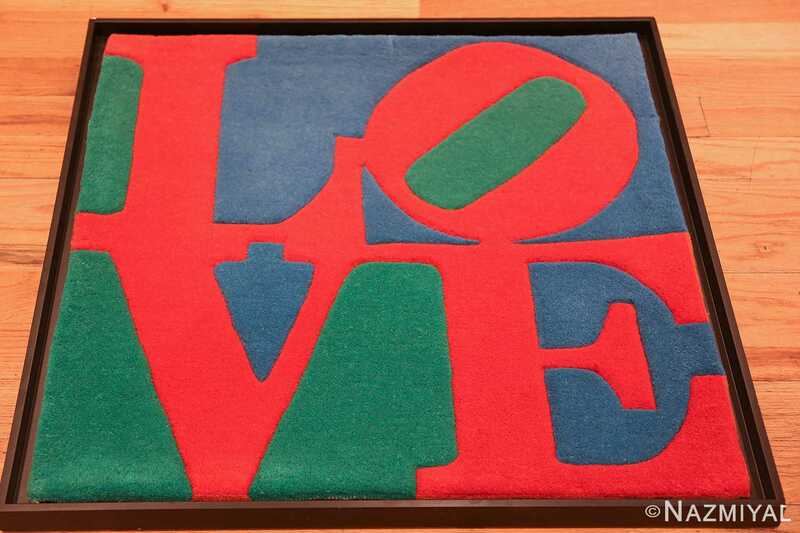 This modern small size Pop Art Love rug by Robert Indiana is a necessary for any interior design that needs a little bit of love. 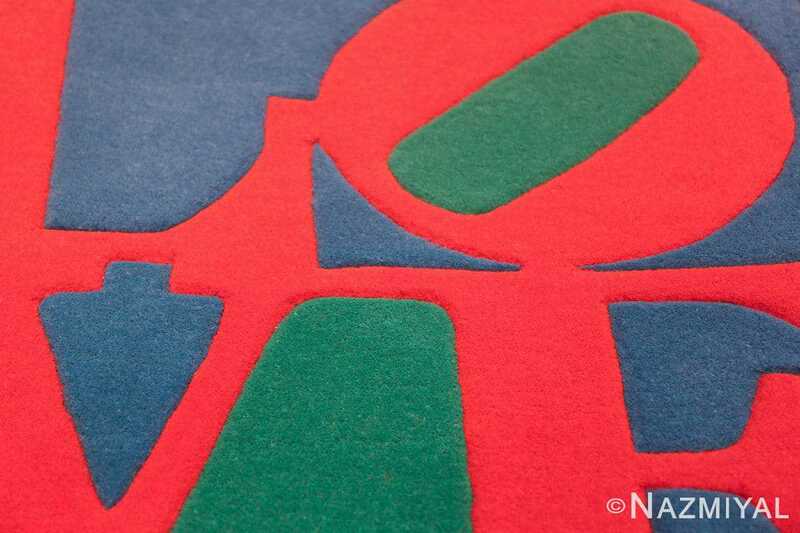 It is a magnificent modern rug that will surly bring a smile to anyone who sees it.